Size: 32 x 24 cms. From the 1851 Illustrated Atlas of John Tallis. 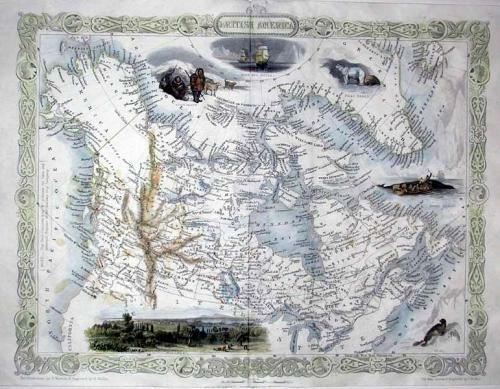 A steelplate engraving map of present day Canada. Tallis maps were highly valued for their accuracy, but perhaps more so for their charming vignettes and ornamentation. Engraved by John Rapkin, these maps were praised by the New York Sun as "the most accurate and most splendid publication of the kind ever issued". The Bristol Times observed that Mr. Tallis maps "are not only critically correct, but are accompanied with elegant and appropriate engravings illustrative of the manners and costumes of the different countries." The map is in very good condition, on quality paper, with bright original colours. There are a few spots in the Pacific ocean.